The book is both a scholarly exposition of the philosophical principles of Sthapatya Veda and a practical presentation of the rhythm and creation of rhythm bound forms which give rise to a variety of structures. A complete compendium on the science of Sthapatya Veda, popularly known as Vaastu Veda, with special reference to principles and practices of Vaastu based building architecture. Apart from the valuable textual matter, the book is also enriched with illustrations on the design process and aesthetic elevation treatment for buildings based Vaastu. For any serious student of Vaastu Shastra this book is an essential bible. It is the culmination of the life work of Dr.Sthapathi, India's foremost temple builder, architect and Vaastu house builder. Dr. Sthapathi's words, like his buildings, are alive with consciousness and spirit. "Vaastu Shastra has nowadays come to be related to the mere design principle of located the bedroom and kitchen inside a built space and only very few think beyond this point as to what is that which brings in a spritually alluring ambience when the built space or oriented according to Vaastu. Now comes the question of the attributes of the Space that surrounds us. Is there any relations between our inner space and the space surrounding us? If so, what is that? And how is the resonance between our inner space andbuilt space effected by the Vaastu science? What is that which we are able to experience when we are inside a temple in front of the sanctum-sanctorum? Can we say that it is the resonance in vibration of our inner self and that of the built space of the sanctum, which in popular terms is called "Bhakti?" Quite intriguing isn't it?" 2. Central theme of Sthapatya Veda. 3. Vaastu Shastra - a scientific treatise - not a religious document. 4. The twin scriptures of Vaastu and Agama Shastras. 5. Vitruvius - architect on craftsmanship and scholarship. 6. Traditional Indian science and technology. 7. Sacred geometry of Dr. Robert Lawlor of Australia. 8. Genesis of traditional Indian science, art and architecture. 9. Vaastu Shastra, a class by itself. 10. Vaastu Shilpa, as advanced science and traditional technological practice. 11. Two fold OM and five fold Veda. 12. 'Time and Space' - 'Rhythm and Form'. 14. Vastu Reva Vaastu - subtle to gross, energy to matter. 15. Measure of Earth's Mantle. 16. Mayan, the Great Scientist of Bharat. 17. Shilpa Vidya-Rahasyopanishad - Vaastu sutropanishad. 18. Rig Vedic Vaastoshpati Sukta - Vishwakarma Sukta. 19. Tala system of spatial measures. 20. Selection of building site. 21. Orientation of buildings, cities and villages. 23. Vaastu Purusha Mandala as applied in scientific concept. 24. Concept of time and space and design of building spaces. 25. Effect of subtle and gross spaces on human system. 26. Discussion on the designing of house buildings. 27. Archetypal or basic patterns for house buildings. 29. Outlines of temple architecture. 30. Trees and plants in and around the buildings. 31. The absolute, pure and auspicious cosmical periods of Vaastu. 32. Vaastu Puja and Vaastu Homa. 33. Building designs based on Vaastu principles. 34. Biographical sketch of Dr. V. Ganapati Sthapati. Dr. V. Ganapati Sthapati was born at Pillayarpatti, a village in Tamil Nadu. He hails from an illustrious family of traditional architects and sculptors, with an unbroken lineage of centuries, who built the great Brihadeeswara Temple at Tanjore. Dr. Sthapati was the Principal of the Govt. College of Architecture and Sculpture at Mamallapuram, near Chennai, for many years. Now he has founded the Vaastu Vedic Trust and created a research institution called the Vaastu Vedic Research Foundation. He has designed the palatial library and administrative block of the Tamil University at Tanjore, the Muthiah Mundram at Madurai and several other buildings and complexes, which are looked upon as visual musical forms. He is also the master sculptor and builder of the huge 133 feet statue of Thiruvalluvar in stone, which stands off the shore in mid-sea at Kanyakumari, at the southern tip of India. He has organised several international seminars and workshops in India and abroad on the Vaastu tradition. He is the author of many books related to the ancient science and art of Indian architecture and sculpture. At present he is also Professor and Head of the Dept. of Sthapatya Veda, in the World University of Traditional Indian Science and Technology and Culture at Chennai. Bibliographic Information: viii+431p., Illustrations; 28cm. Dr. Ganapathi Sthapathi is one of a long and illustrious lineage of masters of Vedic architecture. His ancestors have constructed many great temples in Tamil Nadu and through his words one connects with the depth and magnitude of this lineage. His writings are clear and scientific, he is also using the Shastra as his point of reference for any conclusion. He deals with the subject of Vaastu in a rarely profound and poetic way. Sthapatya Veda (the original name of Vaastu), is a huge science that can pave the way for a much better world if it is applied more and more in public and private buildings. This book is a rare treasure of Vedic architecture covering all aspects one needs to know to construct in accordance with this science. oh conformation is what we do best when we begin to gather as one nothing . btu or beautiful truly mistical vibrations feel it.. I sure do! I am a researcher and student of Vaastu for 8 years. My architectural design practice is exclusively dedicated to Vaastu Architecture. I design buildings in this tradition all over the world. 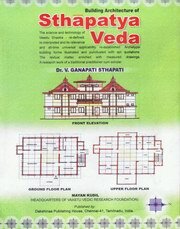 The Building Architecture of Sthapatya Veda is the only book in which I have confidence. It has complete and accurate and accessible knowledge on this subject. I highly recommend it. I was very fortunate to spend time with Dr. Ganapathi Sthapathi, the author of this book at his home and offices in South India. I was touched by his profound insight, wisdom, inspiration and vision for a greater humanity. Vaastu embodies a vision of a world that is aligned with Spiritual life, with natural living and with perfect forms. Dr. Sthapathi is a beautiful teacher and in this book he has shared his heart and soul's work. This is the essential book on Vaastu Shastra (called by it's original name of Sthapathya Veda) for all those who seek it! I am a researcher and student of Vaastu for 8 years. My arch ..